Because copyright is loathsome, I have waived all copyright and related or neighboring rights to all information published on this site, to the extent possible under law. See CC0 for exact terms of this waiver. 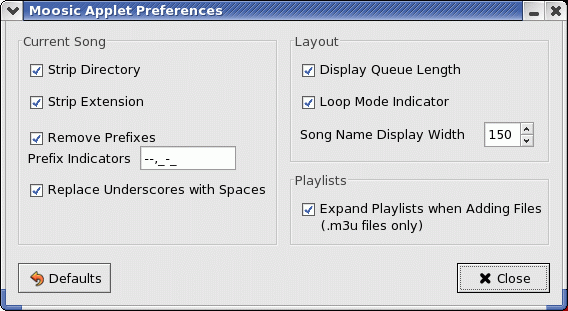 This applet for the GNOME panel is quite useful for quickly and easily viewing the current state of the Moosic player. It also provides some basic features for controlling that state. This applet was started by me (Daniel Pearson), and Paramjit Oberoi <param@cs.wisc.edu> quickly took over its development and turned the original rough draft code into the fine release that is available today. Here's a usage tip: if you want to bind the multimedia keys (or other keys) on your keyboard to actions that affect the Moosic server, the xbindkeys program is recommended. The README file for the current release contains important information on requirements, installation, and usage. You may view the Changelog to see the changes that have been made recently. Version 0.3.2, released on Monday, Nov 14, 2005. Version 0.0.5, released on Thursday, Feb 05, 2004. Version 0.0.4, released on Thursday, Jan 15, 2004. Version 0.0.3, released on Sunday, Nov 30, 2003. Version 0.0.2, released on Saturday, Nov 15, 2003. Version 0.0.1, released on Saturday, Nov 15, 2003. You may also download the applet from Paramjit Oberoi's own web site. This picture shows the applet in action. I'll describe each of the visible features, from left to right. The green icon indicates that new songs will continue to be played when the current song finishes. The number "108" indicates that there are 108 songs waiting in the queue. The text "The Revolution Will Not Be Televised" is the name of the current song. Finally, the four buttons on the right side perform "Stop/Play", "Pause/Unpause", "Previous Song", and "Next Song". This picture shows off the dialog for modifying the applet's preferences. I think it's pretty self-explanatory.